Why is Ancient Philosophy Still Relevant? 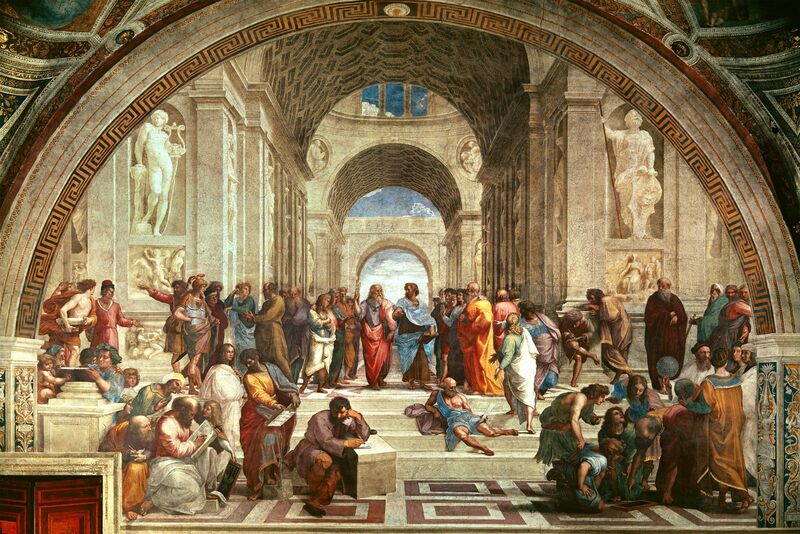 Raphael’s The School of Athens – Ancient philosophy in a picture. Why on earth am I devoting years of my life to studying (and practicing) Stoicism? Good question, I’m glad you asked. Seriously, it would seem that the whole idea of going back two millennia to seek advice on how to live one’s life is simply preposterous. Have I not heard of modern science? Wouldn’t psychology be a better source of guidance, for instance? And even philosophy itself, surely it has moved beyond the ancient Greco-Romans by now, yes? And yet, I’m clearly not the only one here. Setting aside that a sizable number of people these days seem to be interested in Stoicism in particular (the Stoicism Facebook page is over 12,000 strong and growing), there has been a resurgence of virtue ethics in general (mostly in the guise of Neo-Aristotelianism), and of course millions of people around the world still find valuable guidance in the sayings of Buddha or Confucius. Why? It isn’t that these people are ignoring science, cognitive or otherwise. I, for one, was initially trained as a biologist, and I fully appreciate what modern science can tell us about human life and flourishing. I am also a 21st century philosopher, so I am cognizant of Hume, Kant, Mill, and so many others, all the way to Peter Singer. And yet, there is clearly something that the Stoics, the Epicureans, the Peripatetics (followers of Aristotle), the Buddhist, the Confucianists and so forth clearly got right. There is something they thought about and taught to their students that still resonates today, even though we obviously live in a very different environment, socially, technologically, and otherwise. The answer, I think, is to be found in the relative stability of human nature. This is a concept on which the Hellenistic philosophers relied heavily, though they didn’t use that specific term. For Aristotle, humans were essentially rational (meaning capable of reason) social animals. The Stoics agreed, and in fact their theory of oikeiosis (“familiarization”) was essentially an account of developmental moral psychology: young humans have a natural propensity toward self-regard and regard for those who are close to them (mostly, their kin). Over time, this natural morality gets extended further and further, to friends and others living in the same polis, and — ideally — to the whole of humanity. The process is made possible by the fact that reason builds on a natural instinct, nurturing it and developing it over time. But these days the concept of human nature is seen with suspicion by both biologists and philosophers — though for different reasons. Biologists ever since Darwin have moved away from the simplistic notion that anything complex (like a human being) can possibly be characterized by a small set of essential properties. And rightly so. Homo sapiens is the result of a gradual process of biological evolution, a cluster in evolutionary space, distinct from other such clusters (other species of Homo, now extinct, as well as chimpanzees, bonobos and so forth) only by degrees, not by sharp boundaries. Philosophers, by and large, have become even more skeptical of the whole idea, or at the least such has been my experience over the years. Some simply accept biologists’ rejection of essentialism, concluding (erroneously, I think) that therefore one cannot properly speak of human nature. Others, more drawn to the so-called Continental approach, are suspicious of past (and, indeed, current) use of notions like that of human nature to buttress racism and misogyny. Certainly these are well-founded fears, unfortunately, but again they do not license a wholesale rejection of the concept. I think the modern philosopher who got closest to a reasonable account of human nature was also the one that is famous for most drawing from the science of his time: David Hume. I can do no better than to summarize a lovely paper by Michael Gill published a number of years ago in Hume Studies. Gill bases his analysis on what Hume writes in the aptly titled, given our topic, Treatise of Human Nature, and sets it against the background of a controversy concerning the origins of human sociability then raging among Bernard Mandeville, Francis Hutcheson, and Anthony Ashley Cooper, Third Earl of Shaftesbury. Gill’s main thesis is that Hume developed a “progressive” account of human nature distinct from that of the three philosophers just mentioned, who agreed that human beings are social, but disagreed on the origins of our sociability: for Mandeville it is self-interest; for Hutcheson and Shaftesbury it is natural benevolence. Mandeville was of a very different opinion, according to which our basic nature is selfish (a la Hobbes) and we organized in groups only to protect ourselves, first from natural dangers, then increasingly from each other. Modern society’s complex “commerce” and “standards of politeness” are made possible by our ability to communicate and write, but are still rooted in our original selfish nature. To understand Hume’s further discussion we need to keep in mind that for him a virtue consists of having a certain motive for action (this is very close to Lawrence Becker’s take on Stoicism and virtue). Now the motive for justice cannot be regard for justice, on pain of circularity. It can’t be self love either (although it did exist in pre-civilized humans, and is therefore natural, according to Hume), since this will often be in conflict with justice. Hume also rejected regard for public interest as a motive for justice, thus apparently (but only apparently!) landing squarely in Mandeville’s camp. Indeed, Hume went so far as to conclude that “In general, it may be affirm’d, that there is no such passion in human minds, as the love of mankind, merely as such, independent of personal qualities, or services, or of relation to ourself.” (Again, something the Stoics would agree on.) Emotions about other human beings, maintained Hume, are always directed at particular individuals, not at humanity in general. The converse is true as well: we don’t get a sense of justice by generalizing our feelings for particular individuals, because sometimes we ought to and do behave justly toward people we deeply dislike. One way to look at this is that the three in question adopted (different) static, “originalist,” views of human nature. Hume, by contrast, upheld a dynamic, progressive view, where originally selfish motives can develop into genuinely altruistic ones. The Humean engine for this change is his famous principle of association: we begin by disapproving of acts of injustice that do not affect us (because they tend to be harmful), and we end up conjoining disapproval and injustice in general. Which means we develop a broader disapproval of all unjust acts, including those that benefit us. This mechanism, says Hume, applies not just to justice, but to all morally relevant sentiments. What are we to make of the Humean solution to the Mandeville-Hutcheson-Shaftesbury debate, from our post-Darwinian perspective? Roughly speaking, we could say that both Mandeville, on one hand, and Hutcheson and Shaftesbury, on the other, were early versions of what today we would call biological determinists — they only disagreed on the qualitative nature of that determinism (selfish for Mandeville, benign for the other two). Hume’s position, however, can be updated in a more nuanced and interesting way, from the vantage point of modern biology and social science. At the risk of stretching Hume’s own intention, I am going to suggest that his acknowledgement of a “natural” status for our moral feelings is a due and reasonable concession to the “naturist” camp in the nature-nurture debate. There is no getting around it: human beings are a particular biological species, characterized by a historically inherited genetic environment that constrains the way we act, feel and think. What elevates this to the lofty status of “human nature” is that our closest evolutionary cousins (bonobos, chimpanzees, and other great apes) have a significantly different genetic and behavioral repertoire. But Hume’s principle of association can be profitably recast as an embryonic theory of cultural evolution (and personal development), according to which we are capable of generating novel (genuine) feelings out of a combination of experiences and our ability to reflect on those experiences. If Hume is even approximately right, and I think he is, that goes some way toward explaining why ancient wisdom is still relevant today: because human nature changes slowly, since it is rooted in the particularities of the human gene pool, which impose constraints on just how different people can be once we abstract from the historical peculiarities of any given culture. The reason Epictetus, Epicurus, Buddha, Confucius and a number of others still resonate with us in the 21st century is because they got something profoundly right about the nature of humanity in the place and time in which they lived. And since such nature — as non essentialistic and slowly evolving as it is — has apparently not changed drastically over the past several millennia, here we are, still studying Epictetus and the others, and still gaining from them the kind of insight that made Arrian take the detailed notes that eventually turned into the Discourses and the Enchiridion as we know them today. Regarding David Hume’s contribution to the understanding of “human nature”, that “human nature” is continuously, albeit slowly (for us), evolving. But evolving to where? to what. possible to live naturally, in accord with nature, as proposed by the stoic philosophers of antiquity. Greg: We have the army in common. Looking back the amount of time I spent shooting a powerful rifle (Lee Enfield .303) in my ear with no protection seems difficult to believe. Later Seneca rode to the rescue. Greg: Thanks for your comments. I wrote an article not too long ago which was published here: Stoicism and Tinnitus. I had the satisfaction after the article was picked up elsewhere of hearing that others had been helped by it. Anyone who has tinnitus will understand why that gave me pleasure. Yes, I can well imagine. I have tinnitus myself – probably from too much loud music in my teens and twenties, and not wearing my earplugs in my Army days. Angela: I am lost in much of what is being written and while it may enthral the sufficiently educated as an academic treatise it is beyond me. I don’t know what neo-Aristotelism is, the “theory of oikeiosis” unknown to me, nor do I understand “rejection of essentialism”, I’ve never heard of Bernard Mandeville or Hutcheson, I’m not familiar with the phrase “the Hobbesian sense and much else. I am familiar with the Seneca, Marcus Aurelius and, particular for me, Epictetus – many of whose comments I have memorised. You, to your credit, have raised an important issue. Is Stoicism to be an exchange on an elevated academic level with references so esoteric that they exclude the ignorant such as myself? Or should it be discussed at a level where it can touch the lives of the great majority? Well you have summed up very succinctly exactly how I am feeling. I took part in Stoic Week 2013 & 2014, the Mindfulness programme in 2014 and attended the two days in London and have continued with the daily meditations and like you I am familiar with Seneca, Marcus Aurelius and Epictetus and the writings of the Stoicism Today Team which have enriched my understanding. I am now beginning to feel very out of my depth and really miss the frequent blogs from lay contributors which often showed me a new perspective to continue to study this amazing template for a good life! We do quite a mix of articles here in Stoicism Today. Some – like those in the last months on parenthood, policing, the environment – are more focused on application (and look for articles on diet, exercise, anger, service industry work, and other topics in coming months). Others might seem a bit more challenging. Stoicism is a philosophical perspective, with a long history, and Stoicism Today (with myself as editor) will continue to publish pieces more steeped in or interpretative of that tradition. If you’d like to try your hand at writing the sorts of pieces you’d like to see more of in Stoicism Today, by all means send them my way! I’ll be happy to see them. – I have ploughed my way through it but it has been like trying to decipher something in a foreign language. How I wish we had more practical every day blogs where people evidenced how Modern Stoicism worked in their lives. I agree. Modern Stoicism will not attract those who could be helped by it without clarity. Thank you – for me there has been nothing very helpful for the past few months. Although I agree that human nature has remained the same, I would trace it back to the Axial Age thinkers (Socrates, Buddha and Confucius) who were the first to examine human experience in the new world of commerce and empire. I can accept that there seems to be relative stability apropos “human nature”, but the very category is partial, both in perspective and content. Human beings betray as much capacity for viciousness and chadenfreuda as they do altruism. Indeed when altruism prevails it’s more an indicator of a stable culture than essential individualised humanity. Doubtless we have essential characteristics, as do Bowerbirds, but our abiding sensibilities are complex and surely not the product of spontaneous human nature or individual discrimination. I can accept our freedom to give or withhold assent to impressions (though even this much freedom, to be exercised, requires heroic self-control in various circumstances), but our “impressions” are always already tutored! Continental philosophy offees much more complex discussions of the topic than political paranoia! I must say in my perusal of neostoicism so far I’m gobsmacked at the total absence of engagement with the linguistic turn; its compelling it’s deeper implications beyond peremptory dismissal as postmodernism. We are social beings and have the capacity to empathise with the fate of “others”, and this can be extrapolated considerably, but there is little that I can see beyond humanist conceit for construing this as human nature. Two thousand years is the blink of an eye in evolutionary terms, and the wonder to me is that we can relate culturally with the ancients. In fact we cannot. But we can relate existentially, and corporeally; the human condition hasn’t changed! For mine we develop epiphenomenally with culture, human nature being a repressed and nearly redundant category. This implies that if our experiences change, so will our feelings, and it raises the question whether human nature might not reflect both genetics and the environment, in which case it might not be stable, because the environment is changing rapidly. You could argue that human nature is a constant, regardless of the environment, but that would be very hard to prove. What about Nazi Germany, or Donald Trump’s supporters, or North Korea? If stoicism is still relevant today, it could only be because the philosophy contains rules that help certain people make better decisions. That’s what I think! Stoicism resonates with me because it expresses better than anything else I have come across how to cope with life. At its core, I suppose, is the conviction that any event outside our mind is neither negative nor positive. And our attitude can decide how we will regard the event. So much can be built on that including the importance of acceptance. I wish Stoicism was taught in every school. Religion never offered me very much. Stoicism, when I discovered it, was a new dawn and I have been grateful every since.